The day after Yule, I was fortunate enough to make it to a book-signing in Charleston, WV. I went because I -somewhat haphazardly- follow the Appalachian author and editor Michael Knost. He had posted on his facebook page that he would be signing books at Charleston Town Center with two other authors/editors, F. Keith Davis and Brian J. Hatcher. If you're in the area, I highly suggest checking out their websites for the dates of future events. I'll talk about Michael Knost and F. Keith Davis at a later date (when I have finished reading their books). 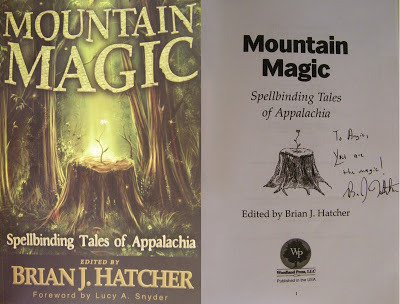 I snagged a copy of Mountain Magic: Spellbinding Tales of Appalachia, edited by Brian J. Hatcher, as a late Yule gift to myself. And since Woodland Press is an Independent West Virginia Book Publisher, I strongly encourage you to purchase the book straight from the publisher (but Mountain Magic is also available at Barnes and Noble and Amazon). Brian J. Hatcher is an author, poet, and editor from Charleston WV. His work has appeared in the Legends of the Mountain State series, the poetry anthology Leonard Cohen: You're Our Man, the Stoker-award winning Writers Workshop of Horror, and Weird Tales Magazine. Brian is a featured author in the third edition of The Midnight Diner, and also appears in The Terror at Miskatonic Falls, Blood Lite 2: Overbite, and the fourth volume of Legends of the Mountain State. Mountain Magic: Spellbinding Tales of Appalachia is Brian's first anthology as editor. Keep up with Brian at www.brianjhatcher.com. Lucy A. Snyder, William Meikle, Frank Larnerd, Kelly Ramsdell Fineman, Steve Vernon, Jean Rabe, Stephen Couch, Joyce Richardson, Joshua Reynolds, Lee Ann Sontheimer Murphy, Karin Fuller, Wade German, Beth Cato, and Steve Rasnic Tem. Magical, in a bloody, grisly sort of way, with a wee dram of Appalachian history thrown into the mix - this is a collection that reads like an evolved version of an old mountain ballad or the fairy tales before Disney got a'hold of the them. While these stories and poems made me think of the old bloody ballads, they were also separate - these are new stories arising from the world that came after the age of the mountain ballads. I'm glad I added this to my Appalachian Literature collection. I enjoyed all of the stories and poems collected here, but my favorite is Fiddlelegs by Steve Vernon - the story is deliciously creepy and I'm definitely looking up more of Vernon's work. 5 out of 5! Woo hoo! Why does everyone act like it's so weird that I gave a book five-stars? LOL! I'm not that critical. Thanks, Angie. Glad you dug the story! If you loved that tale I would DEFINITELY recommend my e-book ROADSIDE GHOSTS, available on Amazon and/or Kindle. Mr. Vernon are you planning any book-signing events in the near future?